An admirable accompaniment to rustic, vintage, and warehouse-style spaces, the Mulberry Industrial Stool has charming characteristics. Giving an industrial design a modern twist, the Mulberry is an original piece with innovative and versatile style. 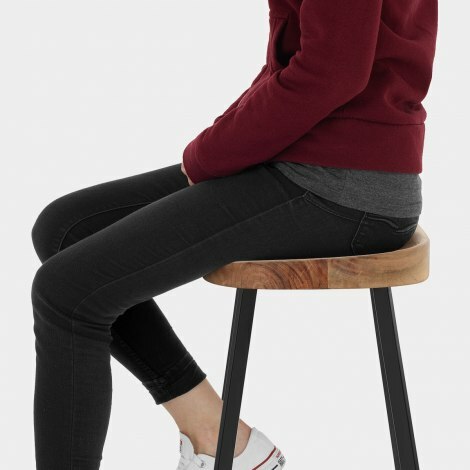 The wooden seat has a sculpted hand finished design for a comfortable fit when seated. Backless and compact, the seat offers great practicality too. A satin black finish gives the industrial-style frame a contemporary edge, and the curved bracing bars and footrest enhance this. Fixed at kitchen height, the legs taper outwards towards the ground and are complete with protective floor pads. Plus, this stool comes fully assembled and ready to use. 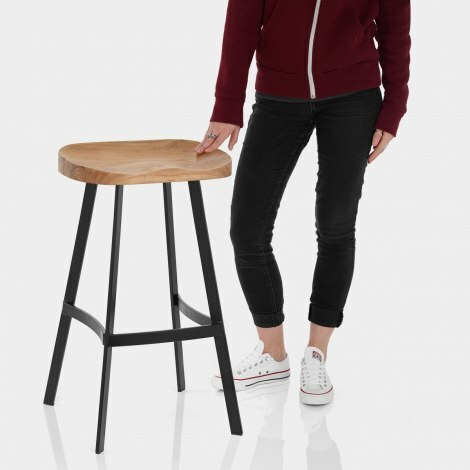 These stools are simple, stylish and very sturdy. The tractor seats cater for all bottoms small and large, and the wood polish will improve with age. Love them, much better than those seen on other sites. The service received from Atlantic couldn't be better - ordered one evening online and they arrived two days later in the morning by courier. Haven't tested customer service for complaints - as don't have any!